John Constable (1776-1837) is famous for his scientific studies of clouds. He was devoted to accuracy and catalogued the types of clouds. This painting presents a different approach that I find quite fascinating. At the edges of this mass of clouds we can see carefully rendered cumulus clouds, but the rainstorm that dominates the canvas is a mass of color and intensity. 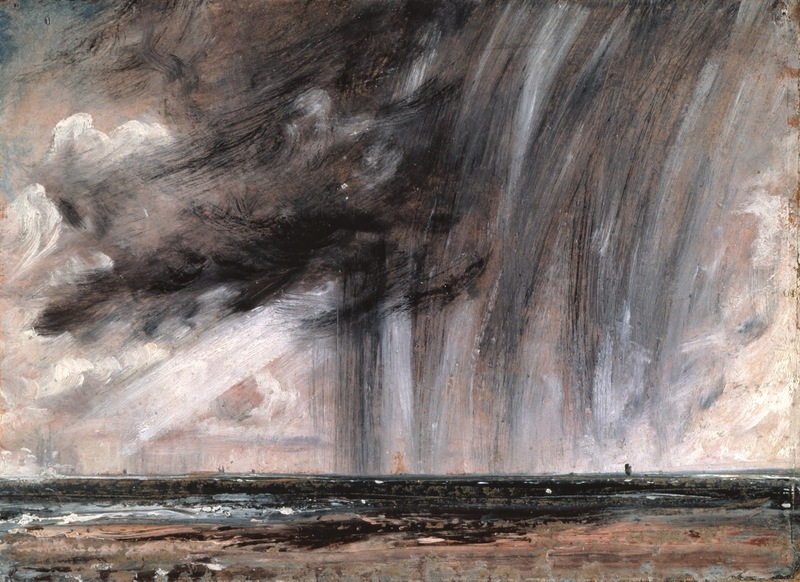 Instead what Constable offers is a thoroughly Romantic scene where the dramatic impact of the storm takes precedence. Constable's brushwork is very interesting, depicting the clouds while simultaneously implying the rain. The ferocity of this Brighton storm is made more overpowering by comparison with the glimpses of sunlight that border it and attempt to peek through. In this work Constable explores the Romantic preoccupation with the sublime, a certain existential awe in the face of the overwhelming power and grandeur of nature.